Before he fought giant moths, defended the world from alien invaders, squeezed out a dopey offspring, stepped on Bambi, played basketball against Charles Barkley, shilled for Taco Bell, and was reborn as a CGI eyesore, Godzilla was nothing less than atomic anxiety personified. 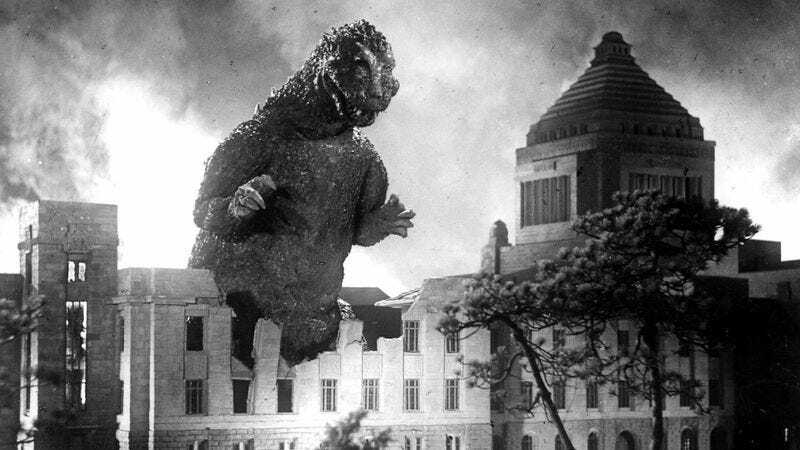 The radioactive reptile made his first appearance in 1954, less than a decade after Truman dropped the bomb on a pair of Japanese cities. The horrors of those nuclear holocausts inform every frame of Ishirō Honda’s apocalyptic allegory, which makes reference both implicit (the footage of post-rampage Tokyo recalls images of an annihilated Hiroshima) and explicit (“Not after I survived Nagasaki,” one civilian groans). And while Godzilla reserves some implied scorn for America, commencing as it does with an allusion to the Lucky Dragon 5 incident, the film doesn’t let its country of origin off the hook either. What is the G-man but a terrible reckoning, the awakened “sleeping giant” Admiral Yamamoto may or may not have spoken of? Honda’s Godzilla—or Gojira, to Japanese audiences—is an art film masquerading as schlock, especially when compared to the whopping 27 inferior sequels it inspired. It’s also a terrific monster movie, a largely unrivaled highlight of the giant-thing-destroys-the-city genre. The special effects, which consist chiefly of a guy in a rubber suit stomping on model buildings, weren’t even cutting-edge in 1954. But Honda orchestrates the play-pretend chaos with great skill, capturing iconic images of destruction. His big set piece is a devastating, nighttime siege on Tokyo, the godlike being framed against a burning metropolis, the streets teeming with screaming extras. It helps that Honda teases the arrival of his creature with thunderous footsteps—a trick Spielberg swiped for Jurassic Park almost 40 years later—and sets each attack to the stirring fanfare of Akira Ifukube’s instant-classic score. As terrible as the 1998 Hollywood remake turned out to be, it makes a certain sense that Roland Emmerich would be the director to bring Godzilla to America. After all, the original is something of an ancestor of the modern disaster movie, opening with ominous warnings of the mayhem to come and crosscutting among concerned parties as they prepare for the worst. Yet, Honda lacks the genocidal giddiness of his directorial descendants; he values the lives his monster steals, and takes time to honor them—as in a shot of a mother cradling and reassuring her doomed children, or a scene of a radio journalist saying goodbye to his listeners as his fate is sealed. Godzilla is so thoughtful, so anti-extinction, that it even treats its ultimate solution—the “Oxygen Destroyer” that fells the beast—with pacifistic distrust. The device’s creator, played by Akihiko Hirata, fears that using it on Godzilla will just inflict a new weapon upon the world. For years, Godzilla was available to U.S. audiences only in the form of the domestic theatrical cut, which not only trimmed the running time—mainly to remove scenes critical of our country—but also included a new character, an American journalist played by Raymond Burr. Godzilla, King Of The Monsters, as this alternate cut was titled, is not without interest; Burr’s narration provides an almost noir flavor, and it’s fascinating to see the actor inserted, Zemeckis-style, into existing footage. But the original, with the overt nods to nuclear fallout, is the one to see. Thankfully, Criterion released a restored cut of the Japanese version a few years ago, and Rialto has rereleased the film to U.S. theaters twice—once in 2004 (for its 50th anniversary), and again this year (for its 60th anniversary, and to coincide with the new Hollywood version opening later this week.) At home or on the big screen, it remains a striking, timely evocation of cultural dread—real horrors made unreal, perhaps in a game attempt to process them. Availability: Still making the big-city rounds on a restored print, the original Japanese cut of Godzilla is also available on Criterion Blu-ray and DVD, which can be obtained through Netflix, and to rent or purchase from the major digital providers.